When you understand shifting baseline syndrome it forces you to continually ask what is normal. Is this? Was that? And, at least as importantly, it asks how we “know” that it's normal. Because, if it isn't, we need to stop shifting the baselines and do something about it before it's too late. This looks to be an important finding by University of Tasmania researchers (lead Nicole Kirchhoff). Tasmanian researchers have found tuna are bigger and healthier when they are farmed further away from the shore. 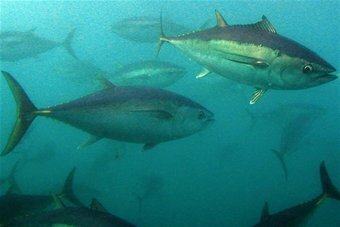 Researchers from the University of Tasmania looked at southern bluefin tuna farmed at Port Lincoln in South Australia. It found the tuna thrive when they are raised in deep water 50 kilometres out to sea, about twice as far offshore as standard aquaculture practice. The tuna had lower mortality and fewer parasites commonly found in traditionally farmed fish. Lead researcher Nicole Kirchhoff says four Port Lincoln companies have already moved their cages further out to sea based on the findings and companies around the world are likely to follow suit. “They grew twice as fast and they barely had any mortality at all,” she said. 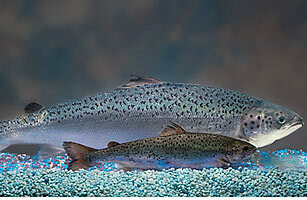 We will look for the original research – to see how much the feeding input increased to achieve the larger fish. Meanwhile read the whole thing. STOP fishing in the Atlantic for a decade and you will boost profits for a lifetime. At least, that’s the conclusion reached by a UK-based think tank, which says that paying the fishing industry to keep its boats on dry land while stocks recover makes good economic sense. The New Economics Foundation examined 49 overfished fish stocks in the north-east Atlantic. NEF concluded that if all fishing were stopped, stocks would recover within 10 years, depending on how fast the species reproduce. Equivalent salaries for this period would cost €10.56 billion ($13.81 billion). However, larger catches from recovered fish stocks when the moratorium ended would recoup those costs within 4.6 years. Assuming the stocks were then fished sustainably, the larger yields would generate €139 billion of extra revenue within 40 years of the start of the ban, according to the NEF report. In reality the costs would be higher, because the report doesn’t consider job losses in the fish-processing sector, says Callum Roberts at the University of York, UK. But he says temporarily stopping fishing would probably still work out financially in the long run. Guest post by Jonathan H. Adler, a professor at the Case Western Reserve University School of Law and regular contributor to the Volokh Conspiracy. Fisheries continue to be among the best examples of the tragedy of the commons in action. As Garrett Hardin himself noted in his 1968 essay, “the oceans of the world continue to suffer” from the dynamic of the commons. Alas, little has changed. Ocean fisheries remain in trouble, as study after study reveals. Most fisheries around the globe are fully or over-exploited, and a substantial number have already faced collapse. The problem with fisheries management runs deep. (…) It does not have to be this way. Even before Hardin wrote his essay fishery economists had diagnosed the problem and explained how property rights in fisheries could solve the problem. Specifically by recognizing property rights in a percentage of the catch for a given species (or, in some cases, by recognizing rights in fishing territories), the “race to catch” could be eliminated and fishing crews could be given an incentive to husband the resource. The creation of property rights in the underlying resource aligns the incentives of those who work in the fishery with the health of the fishery. As owners of a share in the catch year-after-year, the fishers have a stake in ensuring there are more fish tomorrow than there are today. The benefits of such a system are not merely theoretical. They have now been confirmed through extensive empirical research. A recent study in Science that looked at over 11,000 fisheries over a fifty year period found clear evidence that the adoption of property-based management regimes, often called “catch shares” or ITQs, prevents fishery collapse. (More here.) This is only the latest piece of evidence supporting the use of property institutions for fishery conservation. As Hardin predicted, the institution of property rights averts the tragedy of the commons. There are many reasons for this. The creation of property rights in an ecological resource not only creates incentives for greater resource stewardship, to conserve the underlying value of the resource today and into the future. It also gives those who rely upon the resource a stake in the broader set of institutions that govern the resource. Please do read the whole thing, and follow up on prof. Adler’s links. Expansion in the world’s human population and economic development will increase future demand for fish products. As global fisheries yield is constrained by ecosystems productivity and management effectiveness, per capita fish consumption can only be maintained or increased if aquaculture makes an increasing contribution to the volume and stability of global fish supplies. Here, we use predictions of changes in global and regional climate (according to IPCC emissions scenario A1B), marine ecosystem and fisheries production estimates from high resolution regional models, human population size estimates from United Nations prospects, fishmeal and oil price estimations, and projections of the technological development in aquaculture feed technology, to investigate the feasibility of sustaining current and increased per capita fish consumption rates in 2050. We conclude that meeting current and larger consumption rates is feasible, despite a growing population and the impacts of climate change on potential fisheries production, but only if fish resources are managed sustainably and the animal feeds industry reduces its reliance on wild fish. Ineffective fisheries management and rising fishmeal prices driven by greater demand could, however, compromise future aquaculture production and the availability of fish products. The article is unfortunately behind the bloody Elsevier paywall. (…) Evidence from more than a dozen ‘natural experiments’ of commercial, developed fisheries supports our conclusion — incentive-based approaches that better specify individual and group harvesting rights, and/or territorial rights and also price ecosystem services promote both economic and ecological sustainability. Recently we found a very valuable fisheries paper on the demonstrated benefits of property rights. This is an excellent reference on the failures of input-based management schemes and the successes of incentives-based schemes. If you wish to know more, using the extensive references and the citing papers, you can go about as deep as you wish into case studies covering most commercial fisheries. (…) Evidence exists that individual harvesting rights can promote collective action in shellfish, demersal and pelagic fisheries (Shotton 2001). In the New Zealand east-coast rock lobster fishery, for example, the introduction of individual harvesting rights prompted commercial stakeholders to initiate a locally focused fishing strategy. The industry successfully requested the regulator to lower the commercial catch and to restrict harvesting to a shorter winter period to make widespread illegal fishing easier to detect (Breen and Kendrick 1997). These and other fisher-initiated management measures have resulted in a dramatic stock recovery and substantially higher quota values (Leal et al. 2005). (…) In the Tasmanian abalone fishery, individual quota-holders with direct involvement in advising the regulator successfully lobbied for large reductions in the total catch in the late 1980s. This allowed the stock to rebuild and the quota-holders were the principal beneficiaries of subsequent increases in the total harvest (Tasmanian Abalone Council 2003). The successful rebuilding of the Icelandic herring stocks, through cuts in the TAC, were also strongly supported by industry because fishers wanted to protect the asset value of their harvesting rights (Hannesson 1996). (…) it is not surprising that holders of such rights will be prepared to invest their time and effort to protect their flow of benefits from fishing. This may take the form of funding for more on-board and dockside surveillance, increased research to improve the quality of scientific advice, and greater participation in management decision-making. For example, in the BC sablefish fishery — managed by individual harvesting rights since 1990 — fishers initiated and funded research on trap escape rings that dramatically reduced juvenile capture and mortality. After individual harvesting rights were introduced in BC’s halibut fishery, harvesters (through their industry association) have set up and pay for dockside monitoring that tags every fish (Grafton et al. 2000). Similarly in the BC groundfish trawl fishery, also managed by individual harvesting rights, fishers are strong supporters of science and have contributed millions of dollars to research (Rice 2003). Elsewhere, such as in New Zealand’s fisheries — managed by individual harvesting rights since 1986 — fishers, through their associations, are important financial contributors to management and are also active participants in some fisheries research (Lydon and Langley 2003). …of US regulations? This article by Tom Gogola makes that case. The thesis is plausible, but Gogola’s evidence is anecdotal, including personal observation on some NE commercial boats. As I was reading, I kept thinking “could property rights fix this problem?”. (…)Derby fishing means that fishermen will “hit it hard, often in bad weather,” says Benaka, in order to get their share of the overall quota. Under catch-shares, “each boat has a right to catch a certain amount of fish in the season; they can fish when they want to, they can base their schedule on the weather, how safe it is, the markets—when the market might peak, when they can get a better price,” he says. “If they are fishing in that manner rather than under a tight deadline, they’ll be more careful and will try to reduce the bycatch”; i.e., they will fish in a way designed to maximize their yield and minimize the time spent sorting through the catch to get at the fish for market. Read the whole thing — a good article. And please, tell your elected reps to eliminate “derby fishing” in favor of ITQ (it works). Food writer Josh Ozersky gets the story of the genetically-modified Atlantic salmon about right. He doesn’t discuss the Alaskan wild salmon fishery, which is AFAIK still doing fine. But that fishery cannot come close to satisfying the global demand for salmon. What we need is sustainable aquaculture that doesn’t deplete the fish protein stock with fish meal production, and the waters with excrement and other by-products of the current predator fish farming methods. (…) There’s nothing wrong with modifying food to make it easier for us to grow. There are no black Angus cows grazing in the wild; they’re the product of breeding for size, marbling and fast growth, not unlike the genetically modified salmon. If a farmed fish is bad for people, it needs to be banned until the problem is solved; but farming fish, in and of itself, is something that needs to be worked out — and soon. Eating the so-called “Frankenfish,” however scary it may sound, is a small price to pay for saving the world. And who knows? Some day it might even taste as good as its wild cousins. 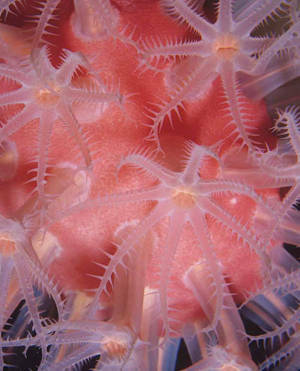 This recent article in The Scientist is sub-titled Marine protected areas reduce coral loss, but they are not enough. Reefs need to be managed for resilience to a host of interacting local and global stresses: The rapid losses, slow recoveries, and host of accelerating stresses make it urgent that we develop efficient strategies for intervention, based on an understanding of the ecology of coral reefs. While marine protected areas are critical to success, they alone are unlikely to allow reef survival because most are too isolated, too small, and cannot adequately leverage recovery of adjacent areas. We need to find effective ways to make damaged reefs more receptive to larval corals and thus better able to stop the death spiral that is occurring on today’s reefs. This will involve limiting the harvest of a critical mix of reef herbivores that prevent seaweeds from blooming on coral reefs. Because almost all major stresses shift reefs from corals to seaweeds, a better understanding of the processes and mechanisms underlying this shift, and its reversal, will be critical for preventing and reversing losses of coral reefs. To optimize our management efforts, we need information on the mechanisms involved in seaweed-coral interactions at all stages of the life cycle, the seaweeds that are most damaging to corals, and the mix of herbivorous fishes that consume the most damaging seaweeds. In short, we need proactive management that goes beyond establishing marine protected areas and hoping for the best. Will Howard has been updating us on fisheries management resources. Included was the bad news on the initiative to ban trade in Atlantic bluefin tuna. The amendment introduced by the EU and Monaco was defeated, with 20 votes in favour, 68 against and 30 abstentions “in the middle of much confusion about the voting procedures and mixed feelings of satisfaction and frustration from participants,” CITES said in a statement. I admit to puzzlement as to which participants would have “feelings of satisfaction”.